Trilobite Beetles are beetles of eternal youth! Or is it eternal age? After all, it's a beetle that never quite grows up but at the same looks a lot like a 250 million-year-old trilobite. I guess you just can't keep a good arthropod down. Trilobite Beetles are more than 20 species belonging to a genus properly called Platerodrilus, though sometimes going by the alternative name Duliticola. They're found in the rainforests of India and southeast Asia, where they enjoy the musty atmosphere in the leaf litter and near rotting logs. Their common name, Trilobite Beetle, obviously comes from their utterly bizarre, primordial appearance. The weird thing is that each beetle has looked like this ever since it was an ankle biting, whipper snapping, wee nipper (or 'young' for short). These are beetles who never metamorphose out of their larval form. They just get bigger. So, even as adults their thorax is armoured with three massive slabs of exoskeleton called scutes, each one associated with one pair of mighty legs and no wings whatsoever. 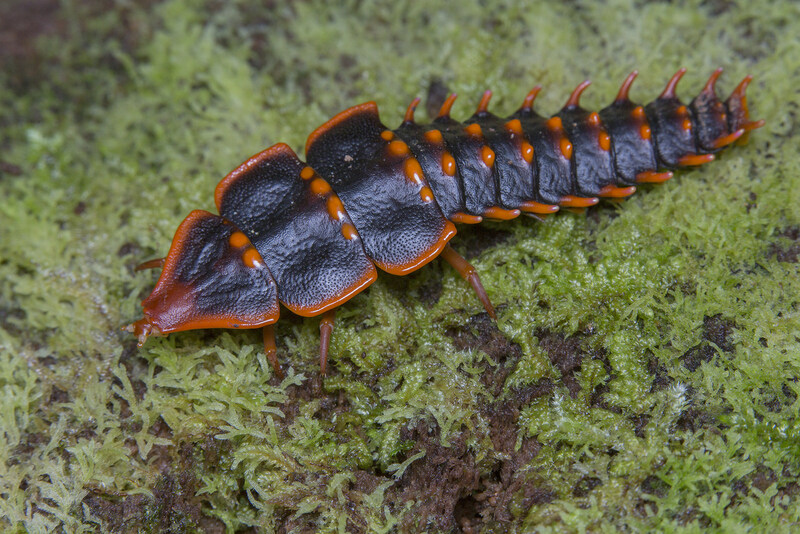 The abdomen is long and richly endowed with ancient spikes and archaic knobs, each one lovingly highlighted with bright orange to stand out against a black background. It's all a bit Ankylosaurus, except that trilobites were there long before those upstart dinosaurs came along and stole all their ideas. Then there's the head... if you can find it! It's incredibly puny and bears two tiny eyes and a pair of short, knobby antennae. It's even more unreasonably small than the Stegosaur's head and, when required, can disappear entirely by retracting into that thickly armoured thorax. So that's a bit of tortoise thrown in, too. Those Ankylosaurs didn't think of that now, did they? They must be kicking themselves. Or swinging their bone-club tail at their shins. 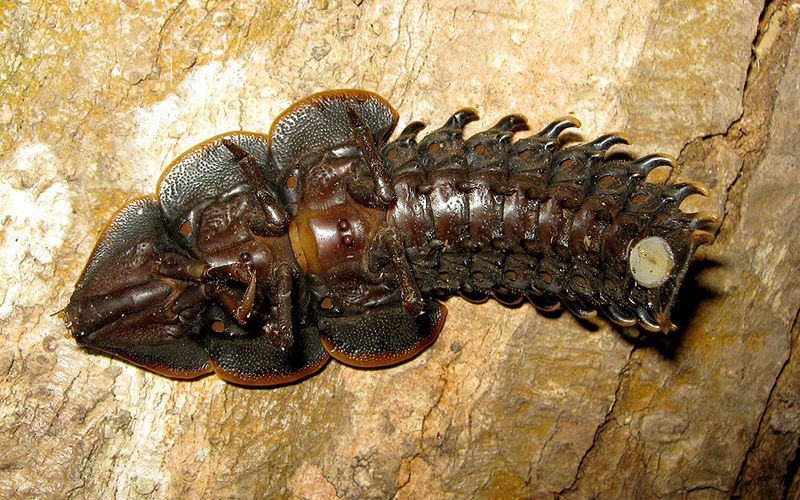 Trilobite Beetles don't have a club at the end of their tail, nor any kind of weapon. Instead, they have a sort of stopper that they can press against the ground. It's useful because Trilobite Beetles can reach about 8 cm (3 in) long and lack the kind of fleshy prolegs we see on caterpillars. With that stopper taking the rear and the big legs up front, Trilobite Beetles can walk in a slow, stately march while the abdomen wriggles behind them. That way, they don't have half their body dragging along the floor like the train of an armour-plated wedding dress. All of this is the female. Males are completely different. Which is to say, they're completely normal. 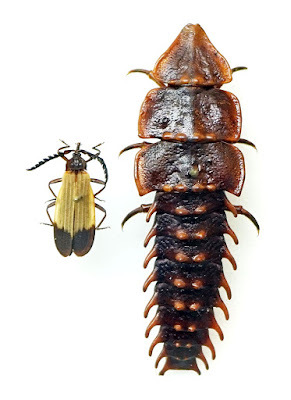 Trilobite Beetles belong to a family called Lycidae, the Net-winged Beetles, and males retain the long, narrow body shape common within that family. They're also about 6 mm long, a tenth the size of their lady friends. These males have wings to fly and tough wing covers because that's what adult beetles are supposed to do. Aside from that, there's a lot yet to be discovered about Trilobite Beetles. No one's quite sure what they even eat! Among Net-winged Beetles, it's common for the larvae to hang out in rotten logs and leaf litter feeding on worms and snails. 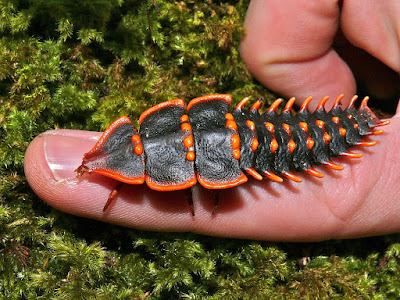 It's possible that Trilobite Beetles do the same, although some people think they actually eat fungi and the like. Or maybe that's wrong, too? They might feed on what I think we can reasonably call 'rot-juice,' the nasty liquids that seep out of rotting wood. And I think we reasonably call that stuff 'nasty' because it's full of all manner of tiny protozoans and mites. Of course, for a Trilobite Beetle that would be a delicious, meaty soup. I'd prefer chicken. Adult Net-winged Beetles typically do most of their eating in their youth when they're busy growing up big and strong. As adults they feed on nectar to get the energy they need to fly about and find mates, or else they eat nothing at all. 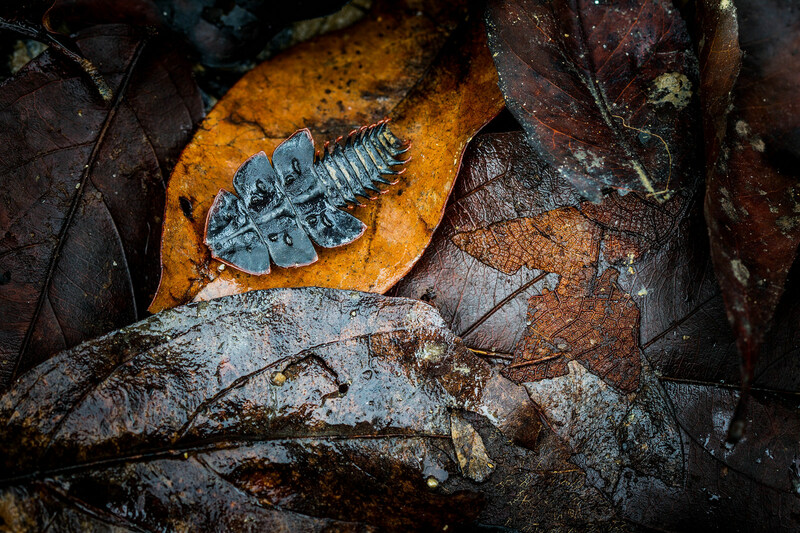 That could be the case for male Trilobite Beetles since they don't seem to live long. This we know from a case when someone actually managed to watch a male and female Trilobite Beetle getting together, getting it on and getting off with each other. Lots of getting was got. The female went out in the open and waved her hind-quarters around, possibly emitting pheromones as she did so. Eventually, a male came along, clamped himself to her gonopore (can we reasonably call that 'lady parts?') and copulated for about five hours. I don't know if he managed that on an empty stomach or if he needed a healthy supply of nectar first. Once they were done, the male died some three hours later (possible evidence of the empty stomach hypothesis). The female laid a sticky mass of about 200 eggs in some leaf litter the next day. A few weeks later, she too died. Gosh. They do say that life was nasty, brutish and short in the old days. I guess the Trilobite Beetle felt content to leave it that way. Yup! They tick all the boxes! That head to body ratio really cracks me up! What animal has the smallest head or brain compared to its body? Anyone who knows? Mabye the answer is here somewhere, and I just haven´t found it yet. @Esther: I know! I don't know why they bothered! @Maria Thulin: I would love to see a smaller head than this. I don't know if such a thing is possible! well, mother nature likes rehashing idea, huh? 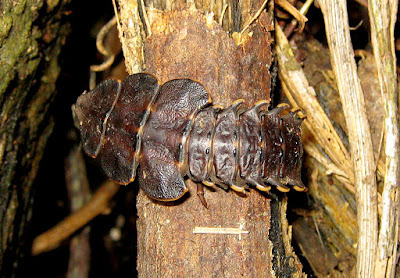 We have a beetle with a trilobite design, can pull its head into its thorax like a turtle/tortoise, and has a caterpillar style stopper at the end of its abdomen. Sounds like me and mother nature will get along splendidly with our hybrids. BTW, i wonder what purpose the spikes on the underside of the abdomen serve. Maybe makeshift legs?